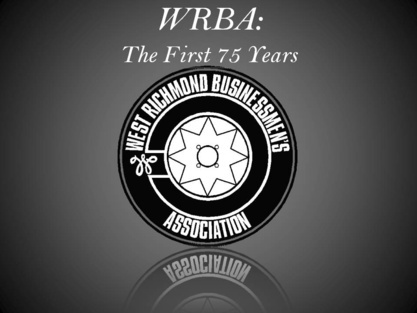 The West Richmond Businessmen's Association (WRBA) is a private, all-male, social organization of Richmond business leaders who gather for fellowship and development of personal and business relationships, while promoting community goodwill. WRBA began informally in the mid 1930's by businessmen in and around the section of Richmond known as Scott's Addition. Although this area was only four miles from the downtown business district, Scott's Addition had no paved streets, curbs, gutters, street or traffic lights. WRBA led the expansion of Richmond westward. In 1937 the group began calling themselves the West Richmond Businessmen's Association. By 1938, Scott's Addition had paved streets, curbs and gutters, and the following year brought improvements in the traffic light system at Boulevard and Broad. The rest, as they say, is "history." Click the image below to view a documentary film on WRBA's first 75 years (23 minutes long). WRBA has not strayed far from its roots. Today, WRBA has five regular dinner meetings throughout the year. In addition, it holds special events: the Prospective Member Reception and Bracket Entry Party in March,the Prospective Member Reception and Texas Hold'Em Tournament in August, Boxing Smoker & Auction in November, Sweetheart Dinner in May and the Golf Tournament and Picnic in June. Members' annual dues cover all of the Regular Dinner Meetings, Prospective Member Reception and Poker Tournament, Boxing Smoker and Golf Picnic. Annual dues are $375. The one-time $125 initiation fee is waived for family of current members. Multiple representatives from the same firm need only pay one initiation fee. Please consider this your invitation to take a look at WRBA. WRBA is a unique, social organization. We stress the camaraderie and fellowship of coming together once a month in a refined, yet relaxed and informal atmosphere. We are glad to see old friends and make new ones. If you're looking to meet new people and make some friends - then take a look at WRBA (and if you happen to get some business from someone within the group, all the better). Remember, people do business with people they have relationships with. WRBA is not a service organization or a tips group. We do not hand out business cards (unless asked). We do not solicit one another. We do not ask you to volunteer for anything. So if you're looking for business leads and to make sales - WRBA is probably not the place for you.